I finally made it home after an intense and inspiring camping/painting trip to the wild and remote Kamchatka region in Russia's Far East. Two weeks were spent painting, photographing and videoing the beauty of this powerful land of volcanoes and bears, in the company of 12 adventurous photographers, and with the protection of two rangers. We observed brown bears on the shore of Kuril Lake in the Kronotsky Nature Reserve, during the bears' ancient, annual ritual of fishing for sockeye salmon. At this time of year, salmon return to the lake from the sea, where they gather before heading upstream to spawn. The stunning volcanic landscape and abundance of bears provided great opportunities for productive sketching and plein air painting. 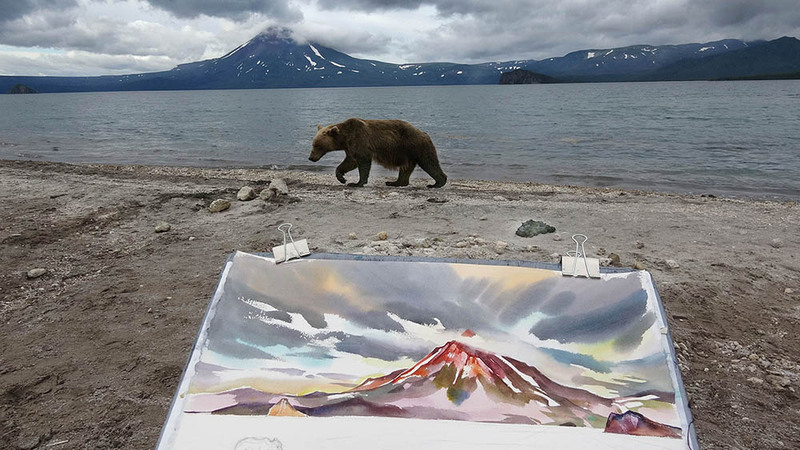 It was easy to be distracted by the bears walking by just a few metres from my easel, despite the majestic Ilyinsky volcano as a backdrop . I look forward to starting work on some studio painting! Bear behaviour and the process of sketching and painting in this challenging, heart-thumping environment are highlighted in the following video. "From Kuril Lake , Kamchatka #1"
Svalbard and the "Ice Bear"